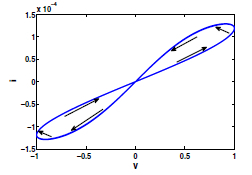 Typical current-voltage (i-v) characteristics of a memristor; the pinched hysteresis loop is due to the nonlinear relationship between the memristance current and voltage. Scientists are attempting to mimic the memory and learning functions of neurons found in the human brain. To do so, they investigated the electronic equivalent of the synapse, the bridge, making it possible for neurons to communicate with each other. Specifically, they rely on an electronic circuit simulating neural networks using memory resistors. Such devices, dubbed memristor, are well-suited to the task because they display a resistance, which depends on their past states, thus producing a kind of electronic memory. Hui Zhao from Beijing University of Posts and Telecommunications, China, and colleagues, have developed a novel adaptive-control approach for such neural networks, presented in a study published in EPJ B. Potential applications are in pattern recognition as well as fields such as associative memories and associative learning. 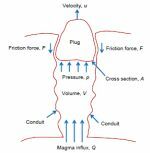 A diagramme showing the plug dynamics and the various friction forces at work. Volcanoes are considered chaotic systems. They are difficult to model because the geophysical and chemical parameters in volcanic eruptions exhibit high levels of uncertainty. Now, Dmitri V. Alexandrov and colleagues from the Ural Federal University in Ekaterinburg, in the Russian Federation, have further extended an eruption model - previously developed by other scientists - to the friction force at work between the volcanic plug and volcanic conduit surface. The results, published in EPJ B, provide evidence that volcanic activity can be induced by external noises that would not otherwise have been predicted by the model. Majorana Bound Sates (MBSs) featured in the red area localised at the nanowire ends coexist with Fermionic Bound States (FBSs) featured in the blue area, where the spin orbit interaction vector changes its direction. What does hair styling have in common with quantum computing? The braiding pattern has inspired scientists as a potential new approach to quantum calculation. The idea is to rely on a network of intersecting chains, or nanowires, containing one-dimensional quasi-particles. The way these quasi-particles evolve in space time produces a braid-like pattern. These braids could then be used as the logic gate that provides the logical function required for calculations in computers. Due to their intrinsic properties, such braids are much more difficult to destabilise and less error-prone. Yet, local defects can still arise along nanowires. In a study published in EPJ B, Jelena Klinovaja affiliated with both the University of Basel, Switzerland and Harvard University, Cambridge, MA, USA, and Daniel Loss from the University of Basel, Switzerland identify the potential sources of computer errors arising from these defects. Nanomagnet rotating about a fixed vertical axis. In the eyes of physicists, magnetic molecules can be considered as nanoscale magnets. Remotely controlling the direction in which they rotate, like spinning tops, may intuitively be difficult to achieve. However, Russian physicists have just demonstrated that it is theoretically possible to do so. They have shown that a change of direction in the circular polarisation of an external magnetic field leads to a change in the direction of the mechanical rotation of the molecule. These findings by Iosif Davidovich Tokman and Vera Il‘inichna Pozdnyakova from the Institute for Physics of Microstructures, Russian Academy of Sciences, Nizhny Novgorod, Russia, were recently published in EPJ B. Possible applications of the phenomenon include rotating magnetic molecules used as molecular rotors to power molecular motors. An illustrative example of the multiplex network of nine nodes with two layers, the red solid) and the blue (dashed) layer. Many real-world complex systems (from living organisms to human societies to transportation system) are best modeled by multiplex networks of interacting network layers. The study of multiplex network is one of the newest and hottest themes in the statistical physics of complex networks. Compared to single networks the current level of our understanding of multiplex networks is far from satisfactory. Pioneering studies have proven that the multiplexity has broad impact on the system's structure and function. Novel phenomena, unforeseen in traditional single-layer framework, can arise as a consequence of the coupling of network layers. In this EPJ B Colloquium Kyu-Min Lee, Byungjoon Min, and Kwang-Il Goh organize and review of the growing body of literature on statistical physics of multiplex networks by categorizing existing studies broadly according to the type of layer coupling in the problem. They discuss the recent major developments and point out some outstanding open challenges and research questions that warrant serious investigation, such as the identification of the minimal couplings (in the renormalization group sense) relevant to the characteristic discontinuous transitions in multiplex systems. 3D graphs of the local density of states with and without spin–orbital interaction for different distances r from the tip. One of the ways of improving electrons manipulation is though better control over one of their inner characteristics, called spin. This approach is the object of an entire field of study, known as spintronics. Now, Richard Pincak from the Slovak Academy of Sciences and colleagues have just uncovered new possibilities for manipulating the electrons on the tips of graphitic nanocones. Indeed, in a study published in EPJ B, they have shown that because the tip area offers the greatest curvature, it gives rise, in the presence of defects, to an enhanced manifestation of a phenomenon called spin-orbit interaction. This, in turn, affects its electronic characteristics. These nanocones could thus become candidates for a new type of scanning probe in atomic force microscopy. Match-stick structure, consisting of a gold sphere (6 nm diameter) attached to a semiconductor nanorod (14 nm length). © J. Ebner et al. Coloured stained-glass windows in churches typically contain metallic nanoparticles. They illustrate how light interacts with matter in a specific way at nanoscales. Depending on the material, different types of excitations arise within the inner structure of the material. By combining two different nanostructures, physicists expect the best electronic and optical response from each material. A team of Austrian scientists has just produced a model describing the optical properties of a matchstick-shaped hybrid nanoparticle, made of a cadmium sulphide semiconductor rod attached to a metallic gold cap. The results have been published in EPJ B by physicist Jakob Ebner and colleagues from the Karl Franzens University in Graz. Similar light-matter interactions have been observed in related systems, such as graphene. Better understanding such interactions could ultimately help in enhancing the sensitivity of chemical or biological detectors, as well as in increasing the efficiency of solar cells. Energy levels of the parabolic QD versus the strength of the Rashba SOC. © J. A. Budagosky et al. Quantum computing will, one day, bring quicker information processing. One of the keys to such speed is being able to control the short-lived physical phenomenon holding quantum information, also known as quantum bits (qubits). A new study presents a novel optical manipulation technique to control one possible kind of qubit—represented, in this case, by polarised electron spins—exposed to an ultra-short pulsed laser in the picosecond-range. Jorge Budagosky and Alberto Castro from the University of Zaragoza, Spain, have tested this novel optics approach using a quantum dot—nanoscopic artificial structures with a small number of electrons—in a study published in EPJ B. A representative Minimum Spanning Tree of the network of countries involved in the FP7 accepted proposals, which captures the backbone of interactions between the countries. © M.Tsouchnika et al. The European Union has a well-oiled funding mechanism in the form of grants given to research consortia. These are essentially made up of collaborating academic and industry-based research organisations. Understanding which type of consortium work receives funding could help future applicants. And it could also bring further transparency on how public funds are spent. Now, Maria Tsouchnika and Panos Argyrakis from the University of Thessaloniki, Greece, have brought valuable insights into the structure of research consortia that are most likely to attract EU funding, in a paper published in EPJ B.
Realisations of harmonic noise. © D. V. Makarov et al. Studying the motion of electrons in a disordered environment is no simple task, mainly because given the effect occurring at the scale of interest—referred to as quantum scale—these electrons are otherwise impossible to examine, due to the presence of incidental phenomena. Often, understanding such effects requires a quantum simulator designed to expose them in a different physical setup. This is precisely the approach adopted by Denis Makarov and Leonid Kon’kov from the Victor I. Il’ichev Pacific Oceanological Institute in Vladivostok in a new study published in EPJ B. They relied on a simulator of electronic motion subjected to noise stemming from a flux of sound waves. These findings could lead to semi-conductor devices of a new kind, operated through acoustic radiations.